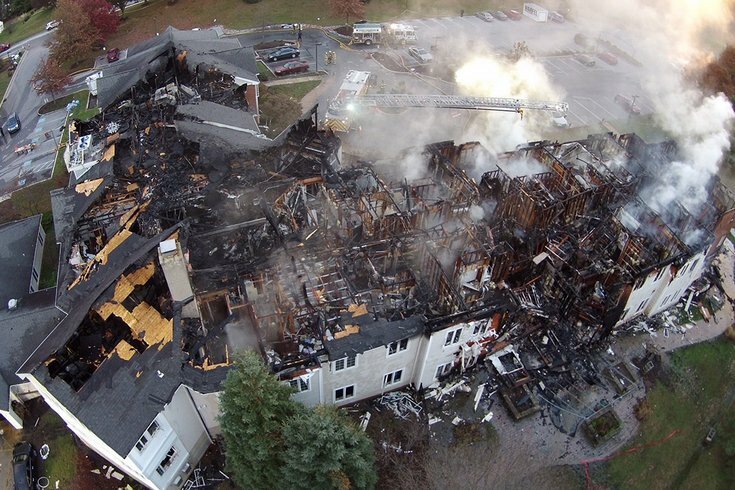 ATF released this aerial photo showing the extensive damage caused by a massive fire Thursday night at the Barclay Friends Senior Living Community in West Chester. The fire is still burning in some spots, authorities said Friday afternoon. The bodies of the two people still unaccounted for after a West Chester senior facility went up in flames last week were found inside the building on Wednesday. Investigators with the Bureau of Alcohol, Tobacco, Firearms and Explosives (ATF), Pennsylvania State Police and the Chester County Fire Marshal's Office found the bodies in the south wing of the Barclay Friends Senior Assisted Living Center, where the blaze broke out. Both victims were taken from the scene by the Chester County coroner, and their families were notified, officials said. The remains of two other missing residents were found on Tuesday as investigators used a large crane and other excavating equipment to remove large sections of debris. All four residents had been missing and feared dead since a fire ignited and quickly ripped through the facility on North Franklin Street around 10:45 p.m. last Thursday. More than 150 residents and staff members were evacuated. Investigators will continue to probe the origin and cause of the fire throughout the Thanksgiving holiday, officials said. The ATF's National Response Team arrived on scene Saturday morning to begin the investigation in collaboration with state, county and local authorities.